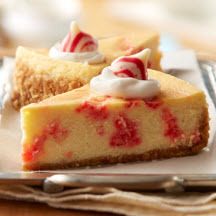 Add a minty touch of Christmas ambiance to cheesecake with candy cane Kisses. Prepare Cookie Crumb Crust: Stir together cookie crumbs and sugar in medium bowl; blend in melted butter. Press mixture onto bottom and 1/2 inch up side of 9-inch springform pan. Bake 8 minutes; cool. Prepare Filling: Beat cream cheese, sugar and vanilla in large bowl until smooth. Add eggs, one at a time, beating well after each addition. Set aside 1/4 cup batter; spread remaining batter in prepared crust. Remove wrappers from candies. Place 30 candies and milk in medium microwave-safe bowl. Microwave at MEDIUM (50%) 1 minute; stir. If necessary, microwave at MEDIUM 15 seconds at a time, stirring after each heating, until candies are melted and mixture is well blended when stirred. Gradually blend reserved cheesecake batter into candy mixture. Drop candy mixture by tablespoonfuls onto vanilla batter. Gently swirl with knife for marbled effect. Bake 45 to 50 minutes or until center is almost set. Remove from oven to wire rack. With knife, loosen cake from side of pan. Cool completely; remove side of pan. Cover; refrigerate until chilled. Garnish with whipped cream and remaining candies. Cover; refrigerate leftovers.